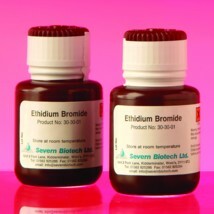 DescriptionEthidium Bromide solution is a ready-made solution used for staining agarose and acrylamide gels containing nucleic acids. 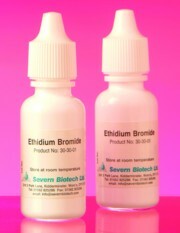 This stock solution with a concentration 0.6mg/ml is supplied in a dropper bottle forma which, due to its conveniencem and safety aspect, is very popular with teaching departments. This form of packaging can accomodate both single use applications for use in kits or supplied in higher volumes and concentrations to suit end user requirements.